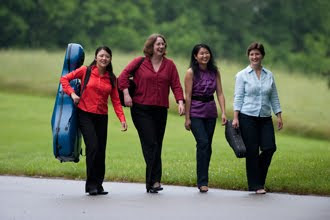 It is so hard to get tickets for the Pyxis piano quartet Kentmere Concerts at the Delaware Art Museum that I traveled to Rock Hall, Maryland to hear them play in the Hedgelawn Classical Music Series at the Mainstay. The Mainstay, a restored 105-year-old grocery store, may not be the ideal venue for a classical chamber series acoustically, but the homey chairs and sofas, the amiable and knowledgeable concert hosts and the charming atmosphere made up for the informality of the setting, and the Mainstay organization has their own small, well-maintained Kawai grand. The quartet’s program was both ambitious and eclectic. A little known set of four pieces which Richard Strauss wrote in his teens provided the quartet with an opportunity to create characterizations - from the cello/piano introduction of the Stȁndchen (serenade) to the Middle Eastern rhythms and bowings for the Arabian Dance. The second piece, the quartet by Joaquin Turina, put the string players to the test. Meredith Amado played very high violin notes effortlessly, with beautiful intonation and control. Jie Jen’s cello had a wonderfully rounded vibrato in the very romantic solo parts. Ms. Jen can make her cello soar to the extremely high registers required in the Turina with great ease. The Piano Quartet in B-flat Major, Opus 41 by Camille Saint-Saens was a showpiece for pianist Hiroko Yamazaki who glided through the complex fugue of the Andante maestoso ma con moto at a very high speed. Amy Leonard’s viola playing was a beautiful middle voice in the fugal writing for strings and piano. The weaving in and out of voices by each musician provided a beautiful tapestry of sound. If you can get tickets for the Kentmere Series Concert at the Delaware Art Museum on Friday , February 17, this program is well worth hearing. The Thursday, February 16 concert has been sold out for weeks.